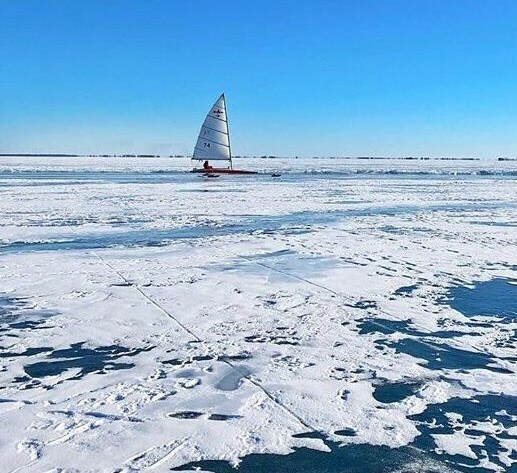 There is nothing quite as exhilarating as sailing on a frozen plane of ice. 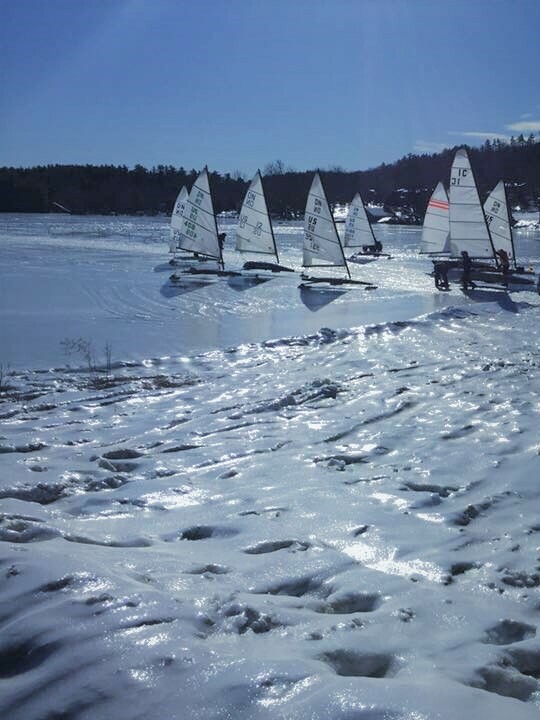 Lake Winnipesaukee offers some of the finest ice sailing in New England. The mere size of the Lake coupled with fairly constant northern winds almost ensures a great ride. From Alton N.H. Take route 11, NW alongside Winnipesaukee toward Laconia. Halfway (approx) you will go down a hill (narrow lanes) and it will level out with wider road ahead and Ellacoya State Park sign on right. You will be almost at lake level and just beyond Marina Road Trail west of Lake Shore Park. Turn in on Scenic Road. Dirt road leads directly to lake front. From Route 93, N. of Concord take Exit 20 onto Rt. 3 toward Laconia. Take Rt. 3 bypass toward Laconia Airport then onto Route 11 toward Alton. Down improved section or road see State Park on left. From Portsmouth N.H. Take Rt.16 (toll).After 2nd. toll, a few miles to Exit 15 (Rt. 11) to Alton N.H. circle.Take Rt.28. Down hill past Kingswood Regional Middle School on rt., slow when you see Huggins Hospital on right. White picket fence on left, turn onto Clark Road. At bottom of hill, turn right to beach parking area. Leave opening to beach as it is well traveled by fishermen and others. The pressure ridges present a great hazard to ice boaters. There’s no way to avoid them, boaters have to find a safe way to cross, despite the fact that the ice is weak at best and at worst, there’s as much as six feet of open water. Navigating around the ridges took the bulk of Rogers’s time and attention. 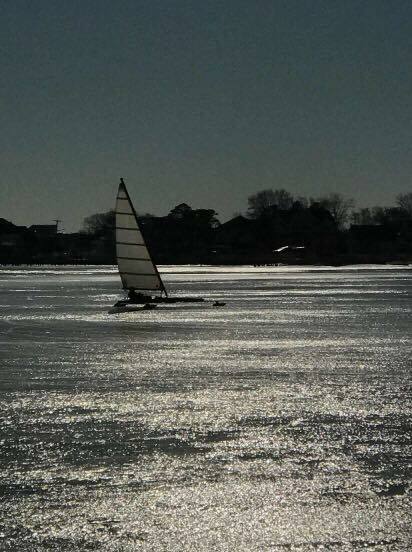 At one ridge, which ended at Governor’s Island, Rogers had to dismantle his boat and carry it across part of the island to reach solid ice on the far side of the ridge…….